Cabinet Picks Come As Democrats Push To Change Filibuster : It's All Politics President Obama's slate of nominees will have to be confirmed by the Senate, but those nominations could be held up by a filibuster threat. Democrats are trying to crack down on what they see as misuse of the filibuster, and it looks like Republicans may be willing to come to a deal. Senate Majority Leader Harry Reid, D-Nev., left, and Senate Minority Leader Mitch McConnell, R-Ky., have talked about a deal to change the Senate's filibuster rules. In recent weeks, President Obama has chosen Sen. John Kerry, D-Mass., as his next secretary of state; former Sen. Chuck Hagel, R-Neb., to head the Pentagon; counterterrorism adviser John Brennan to be CIA director; and his chief of staff, Jack Lew, to be the next Treasury secretary. Each nomination will have to be confirmed by the U.S. Senate, and they all could be stopped by a Senate filibuster — that is, the refusal by any one of 100 senators to let a matter come to a final vote. The nominations come just as Senate Democrats are pushing to make filibusters harder to pull off. Senate Democrats put their GOP colleagues on notice after the November election that when the new Congress convened this month, they would be cracking down on the filibuster. Republicans, they said, had abused Senate rules by mounting hundreds of filibusters over the last few years. They said they could change those rules not with the 67 votes normally required, but by a simple 51-vote majority — as long as the Senate officially remained in its first legislative day. It's what's known as "the nuclear option," and the Democrats' threat to use it infuriated Minority Leader Mitch McConnell, R-Ky.
"Are we going to break the rules to change the rules, employ the nuclear option, fundamentally change the body, not have a negotiation between the two leaders about what adjustments might be appropriate to make the Senate work better?" McConnell said in late November. 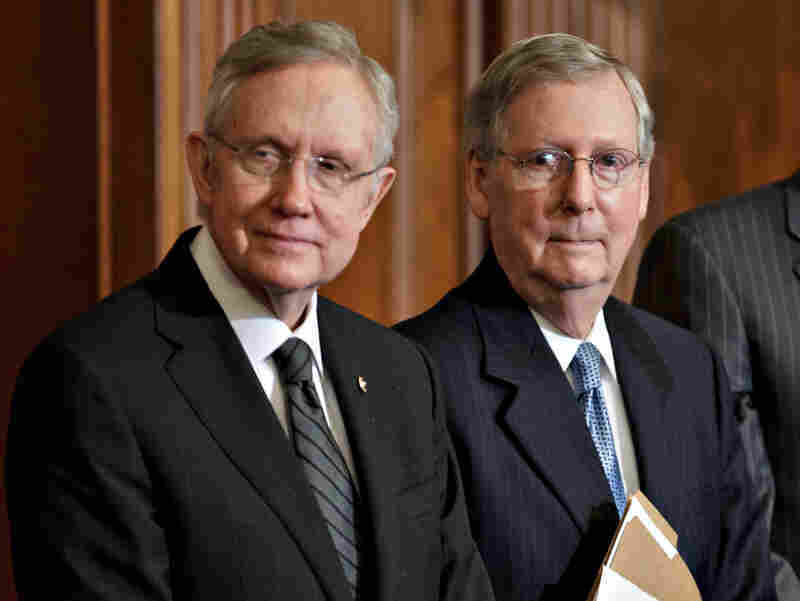 But McConnell now appears willing to cut a deal on filibusters with Majority Leader Harry Reid, D-Nev. The top Democrat has kept the Senate in its first legislative day, enabling a rule change with just 51 votes. But Reid also declared on the Senate's opening day earlier this month that he was ready to work with McConnell to find common ground on changing the filibuster rules. "I am confident that the Republican leader and I can come to an agreement that allows the Senate to work more efficiently," Reid said. "We talked again today. We just haven't had time, with the other things that we've been dealing with, to spend enough time together to do this. But we definitely want to move forward to try to make this place work better." The first step in doing that, said Rules Committee Chairman Charles Schumer, D-N.Y., would be requiring those mounting a filibuster to actually hold the Senate floor by speaking. "If you have to talk, if you have to be on the floor and actually filibuster, as opposed to just invoking the rules, you're going to use it sparingly," Schumer said. Should that happen, the Senate would be going back to an old tradition — as seen in the 1939 movie classic Mr. Smith Goes to Washington, which has actor Jimmy Stewart mounting a talking filibuster on the Senate floor. There's also a push to make it harder to filibuster presidential nominations. Oregon Democrat Jeff Merkley said the Founding Fathers never intended the Senate to be a nominations graveyard. "Show me a Federalist Paper, in the discussions over how the Constitution was put together, where any of our framers argued that advise and consent is designed so that Congress can basically damage the executive branch, judicial branch, by refusing to consider nominations," he said. New Mexico Democrat Tom Udall is confident the rules on the filibuster will be tightened: "The newer members [are] coming in ... the senators who've been here are very impatient with the way the place is operating, and you put those two things together, and I think it gives us some real momentum." Still, most Senate Republicans, and some Democrats as well, are wary of eroding the power of the Senate's minority. Arizona Republican John McCain warns that those pushing for change could one day regret it. "Most of them, in all due candor and honesty, have never been in the minority," he said. "Those who have been in both majority and minority are the most reluctant to see this." If a deal is reached, it would likely require a 60-vote supermajority — the same number needed to end a filibuster.